Strange Weather contains four stories that are subtly linked; each different in theme and style. They are tied together, as you might expect from the title, by some pretty unusual weather. The book begins in 1988 with "Snapshot" which describes 13 year old Michael Figlione living in the Silicon Valley area. He discovers a character known as "The Phoenician", an odd, creepy, tattoo'ed guy taking polaroids of people with a very strange camera. Set in the 80's, for anyone who remembers that period it brings a strong sense of nostalgia, of simpler times without smartphones and internet. A time when it was considered "safe" for children to play out in the neighbourhood. Michael is a geek before geeks were accepted, too clever to fit in with the popular kids. It's a genuinely suspenseful tale, re-enforced by the wonderful characterisation. We then move forward some years to "Loaded" and the story of a Mall Security guard who becomes a local hero after it appears he has preventing a mass shooter from continuing their rampage. As the investigation into what happened begins, our "hero" gets more and more nervous. "Loaded" is an exploration of gun violence, racism and abuse and packs more in a short story than many full length novels do. It's seedy, grimy, shows off the worst of humanity and genuinely shocks, laying bare the reality of American's mass shootings. The third story is a lot more light-hearted, it's also the strangest by far. "Aloft" concerns Aubrey Griffin who despite having a fear of heights agrees to take part in a parachute jump. Officially to honour the memory of a departed friend but in reality, to impress a girl. Things don't go quite as planned however; the plane suffers a sudden electrical failure, forcing the jump just as Aubrey starts to chicken out. He jumps with his instructor but never lands on the ground. Instead finding himself a castaway on a strange, solid, cloud. It's a strange, dream-like, trippy story and reminded me of a Twighlight Zone episode of the 80's. The final story in the collection is my favourite. "Rain" opens with catastrophic event of country wide storms that release nail-like shards, killing any caught out in the open and destroying infrastructure. As the storms continue around the world, Hill describes a post-apocalyptic tale that seems all too likely, bringing out the best and the worst of humanity. There is a bit of a shocker when you find out the cause of the storms. As with the other three tales, the characterisation is superb. Overall Strange Weather is a Triumph. It's thoughtful, topical, in places quite whimsical and in others shocking. It pulls at the emotions with well drawn characters and prose that sings. 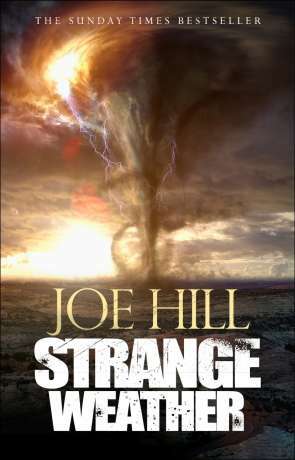 Joe Hill is cementing himself as a gifted and thoughtful writer and Strange Weather is his finest achievement so far. Written on 27th November 2017 by Ant.